So, George Bush Sr. died last night at 94 after a few years of failing health. He was proceeded in death by former First Lady Barbara Bush, who died in April. 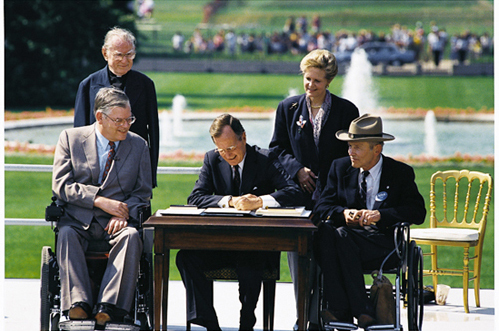 For us crips, Bush’s presidency’s significant in that he signed off on the Americans with Disabilities Act (ADA) in ’90. It’s not perfect, but nothing really is. Still, it’s helped us get a long way in society from being merely homebodies, because of inaccessibility. Whether your affiliation, for that we owe him a debt of gratitude. Our condolences to Mr. Bush’s friends and family.